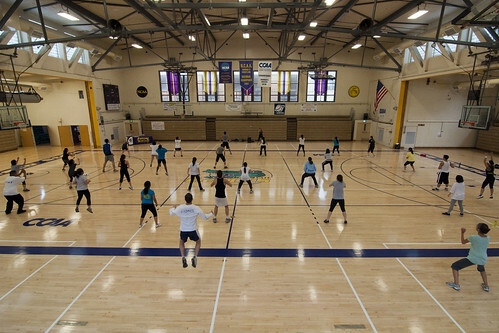 SF State students participate in a free workout session in the gym, Nov. 17, 2011. The event was organized by the Recreation Department and operationbeautiful.com, which aims to build confidence in women's perception of themselves. Photo by Gregory Moreno. That girl you don’t like, your twin, your health, your self esteem — what is your motivation? Whatever you answered, SF State’s Group X classes are designed to help students meet their fitness goals. This was the case Nov. 17 when instructors Jackelyn Ho and Erika Eugenio combined their TurboKick and Guts n’ Butts classes for a special workshop based on helping participants find and use motivation. What Is Your Motivation, held in the gym, was the second workshop put on this semester; the first, which took place in September, focused on the Operation Beautiful movement, which helps women view their bodies in a more positive way. The last workshop picked up where the first one left off. Participants wrote down their motivations on sticky notes and added them to a large poster board. The group sat in a circle at the beginning of the class to discuss the topics. Sae-Ung hadn’t been able to take a Group X class, free to students and faculty, prior to this semester but she’s been making up for lost time. For this program, Ho said they relied on Facebook and word of mouth to market the class to students. “A lot of it was through the classes so we would just tell our students, ‘Look, this is happening Thursday. You guys already come to work out, so just come to this,’” Ho said. Still, it’s usually the same people that attend the events. “I think most of the kinesiology students and people who visit the gym and are more active will proactively look for it but if you were just a person walking through the quad you wouldn’t know about it,” Sae-Ung said. Tamar Wilkins, a study abroad student from England, feels the same way. “I think they should be advertised more, and advertised as free. I almost wasn’t going to go and then I found out it was free and then I was like, ‘I’m definitely going to go,'” said Wilkins, who has taken Guts n’ Butts and Yoga. With or without a large class size, the instructors get out just as much as they put into it. It’s the same for University graduate Eugenio, who teaches cardio kickboxing in addition to Guts n’ Butts. She works at the Village Fitness Center as a group fitness instructor and personal trainer. She liked that the two classes were combined because it gave the students the viewpoints of other instructors. “They get to see both of our energy levels and both of our passions for the same purpose that we have and the same goal, which is overall fitness, health and wellness,” Eugenio said. Ho, who taught the first part of the class, loved being able to teach with Eugenio. “It’s cool because we feed off of each other’s energy. To be able to get both of our range of students in one class is really cool too, because you have her demographic and my demographic and they all just come together for one big party,” Ho said. As for the future, both plan on individually teaching Group X classes again next semester with more workshops as well. A full list of Group X classes and meeting times can be found on the University’s Campus Recreation site. SF State: are we prepared for a major earthquake?